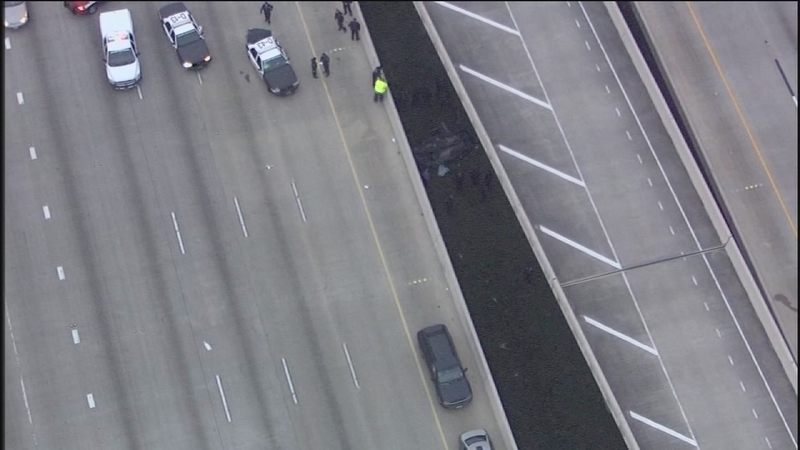 HOUSTON (KTRK) -- Houston police have identified the two men killed when a car hit a patrol car and flipped over the Eastex Freeway on Wednesday. Homar Palacious and Hugo Medrano were identified Thursday. Their ages were not given. The wreck happened around 4:30pm Wednesday on the southbound lanes of the Eastex Freeway at Kelley, just north of the North Loop. Officials say a speeding car hit the back of a Houston police car and catapulted over the top of the guardrail of the southbound lane. The vehicle landed on its roof in the area below, between the freeways. Three people were inside the vehicle that fell from the elevated portion of the road. The HPD officer in the patrol vehicle was taken to the hospital but has since been released.